“Grassless backyards have been around for quite awhile. We lived in Arizona, and most of the yards have no grass. The landscaping is done primarily with rock and other materials. I don't think it was ever a craze. There are even some places in California, such as Palm Springs, that do the same thing. It is cheaper in the long run, and the water bills wouldn't be as high, plus you aren't supposed to use as much water in the desert areas.” Nancy Minkus, An Eye for Color and Design. “CLASSIC. A backyard doesn't need grass to be beautiful, functional or inviting. 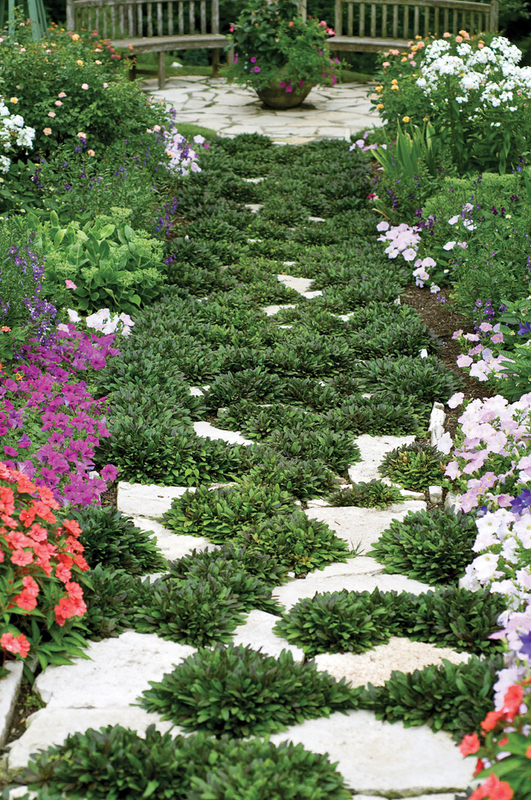 Landscaping with plants, flowers, ground cover, stones, edging and walkways creates color, texture and focal points. Whether you are relaxing, barbecuing, entertaining or viewing your backyard through your living-room window, landscaping can be a serene picturesque view.” Pamela Calvert, Pamela Calvert Design. “I think it is going to be a ‘new classic.’ As people downsize and want to simplify their lifestyles, the less maintenance the better. Who wants to cut grass?” Susan Block, The Designing Block. “Grassless backyards without plants were a craze. All rock, concrete designs went out of style once everyone realized they were downright ugly. For no mowing and little maintenance, try the shade lovers Packysandra, Hostas, ferns and Creeping Jenny. Easy-care selections for sunny areas can include the long-blooming Coreopsis and low spreading Catmint. Sedums are a top choice for exceptional texture and color along with low-water needs.” Ann Lapides, Sugar Creek Gardens. “As a native St. Louisan, I'll be honest, I never have given much thought to grassless backyards. When I think of St. Louis springs and summers, I immediately picture lush green yards, bright, colorful flowers and the sprinklers going nonstop. It seems hard to imagine grassless yards becoming a staple here. I would have to say it's a trend- for now. However, I think the weather is the biggest determining factor of whether grassless yards, or Xeriscaping, will move from being a trend to becoming a necessity. If droughts become more frequent in the future, Xeriscaping would likely catch on here, in an effort to conserve water.” Emily Koch, JCR Design Group.